Wow, throwin' down the gauntlet to the Criterion snobs, I like it. 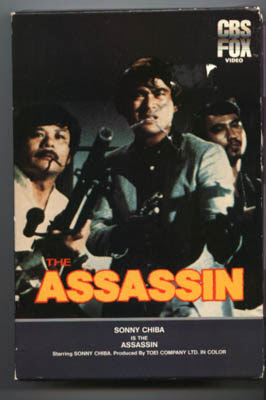 I actually have a Suzuki movie coming today, Take Aim at the Police Van, which is a part of Criterion's Eclipse Series look at Nikkatsu Noir; also, Suzuki is one of my favorite directors. If this is anywhere near the stylish noir that Suzuki is known for, I'm excited to check it out. The only Chiba I've really seen is the Street Fighter series. We would be interested in your opinion, DTVC! Another Chiba to check out is Karate Warriors (1976). Any Chiba is good Chiba! Totally agree, Dr. Blacksteed! He always delivers the brutal goods. Excellent write-up. Have not seen this one. Love the box art. I wish someone would have the brass balls to release obscure action/horror/exploitation flicks on DVD in the old-school clamshell boxes. DTVC: The Karate Bear Fighter/Karate Bull Fighter films are vintage Chiba; well worth checking out. Thanks! That would be so great if they released these types of movies to dvd. Seconded on the DVD clam shell case idea. That would be brilliant. Surely some aspiring film nerd has tried something like this before? Surely? I swear that guy in the front looks like Chow Yun Fat to me. lol. Matthew Conway: I hope so! One day it might happen. RobotGEEK: Thanks! Haha, he kind of does! Looks good. The downside of Criterion's reign is that they make some great movies available while at the same time excluding so many great ones. It's a shame. Karate Warriors I've heard of, so I'll definitely have to check it out. I just finished the Eclipse Nikkatsu Noir series. It took Netflix forever to get them to me, but they were worth it. I'm not sure if you're a Jo Shishido fan (Captain Joe with the puffy cheeks and a drinking problem on MST3K's Fugitive Alien), but he's in a few, and he's fantastic. We have been meaning to check out those Nikkatsu Noir movies and get them on Netflix! Which one is your favorite?